Following earlier posts about dressed cats from Alfred Mainzer and Harry Whittier Frees, I thought an entry on Louis Wain's work was in order. Wain was a British artist whose art focused heavily on images of animated, big-eyed cats in scenarios very similar to Mainzer cats. 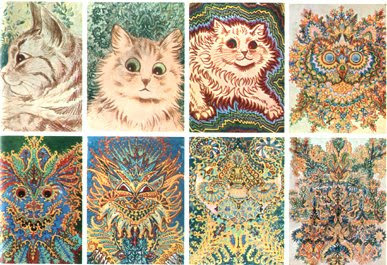 His work took increasingly abstract turns as he suffered from schizophrenia later in life, resulting in kaleidescopic and fractal-like paintings of cats. Oingo Boingo fans might recognize a Wain cat featured on the sleeve of an early EP.